The “Trójkolorowi” (Tricoloured) may have not won a single title since what looks like a very distant 1988, and occasionally they may have reached even deeper lows, getting relegated twice, but even so, no one can deny that they belong to Poland's all-time football elite. The simple facts that no other club has won more Championship titles than them, and they are the only Polish club to have reached the final of a UEFA competition, speak volumes of the historic size of Górnik. The SSA initials stands for Sportowa Spółka Akcyjna, which in English can be translated to "sports stock-offering company" (nevertheless, the clubs is often referred to as Gornik Zabrze FC in English). In 1948, four smaller clubs that had been operating in Zabrze (pronounced Zábzhe, the “r” is not pronounced, instead “rz” sounds like a heavy “z”) since the end of World War II, got together to form KS Górnik (Klub Sportowy, Sporting Club). The founders of the club chose the Polish name for “Miner”, inspired by Zabrze's status as a major coal-mining centre. Less than ten years later, Górnik (pronounced Gúrnik, with “n” sounding like Spanish “ñ”), already won their first Championship. Led by legendary striker Ernest Pohl, they went on to repeat their triumph in 1959 and 1961 (with Pohl earning the title of the league's top scorer both seasons), before setting out to do something that no other club had done before, and none has done ever since; win an astonishing five consecutive Championship titles, starting in 1963. When Pohl left Górnik in 1967, he had celebrated all seven league triumphs, plus, the double in 1965, when he and his teammates managed to win the Polish Cup (Puchar Polski w piłce nożne in Polish) as well. The mark Pohl left on the club's history was such, that in 2005, Górnik renamed their stadium after their legendary striker. Even before Pohl's departure, another star had started shining at Górnik. Włodzimierz Lubański had joined the club in 1962, aged 15, and before even turning 17 he had impressed Poland's football world so much that he made his first appearance with the national team jersey when he was just 16 years and 228 days old. Aged 19, at the end of the 1965-66 season, when Górnik won their fourth consecutive Championship title, Lubański was the league's top scorer, an unbelievable achievement for someone still in his teen years. Incredibly, Lubański went on to top the league's scorers list four years in a row. When he left Górnik in 1975 to continue his career in Belgium, he had won two more Championship titles, plus, he had been key to Zabrze's Polish Cup miracle, lifting the trophy five straight years, starting in 1968. Just as in the Championship's case, no club had won the Cup five straight times before Górnik, and no club has managed to do so ever since. On top of all that, Lubański had been crowned top scorer two years in a row in UEFA's Cup Winners' Cup, with the 1969-70 season being the most memorable of all, when Górnik reached the final, which they lost to Manchester City. That was the first, and remains the only time, that a Polish club made it to the final of a big international competition. In 1985, Górnik started another... epic run in the Polish Championship, another era of absolute dominance, with the Zabrze club winning four more consecutive titles, falling just one short of matching their own “five in a row” record from the sixties. 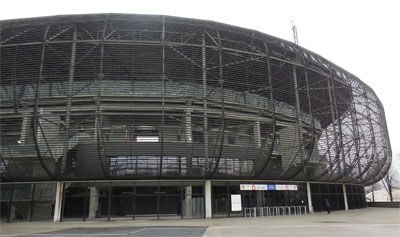 Ever since then, Górnik have lost the reigns in Polish football, they have even found themselves struggling in the second league, but a club with such a history, and, since 2016, with an impressively reconstructed football-specific stadium, has every reason to believe that one day they will return to where they historically belong. Górnik's stadium, after its reconstruction. The big “G” in blue and white obviously stands for Górnik, which is Polish for “miner”, hence the crossed hammers below G. A pair of hammers has always appeared in Górnik's logo, while the golden star on top is a 2011 addition, and represents the 10+ Championship titles they have won.